Horseback riders come in all shapes and sizes; in all ages. It should come as no surprise that men and women considered to be in their "golden years" still enjoy horseback riding.Some, particularly women, discover the enjoyment of riding horses late in life. There are three categories in which riders usually fall: those who have ridden pretty much all their lives; those who rode when they were younger and are renewing their interest; and those who have never ridden. Regardless of which category a woman finds herself; there are some things to consider when riding at an older age. It is often said that "a green rider plus a green horse equals black and blue. "This may be true even more so for an older rider. Aging reduces reflex and healing and the ability to quickly recover from injuries. Therefore, it is important that people find the right match of horse for their riding ability. This may sense like common sense; however, all too often, a rider "falls in love" with a horse that is beyond their abilities to ride safely. An older, well-trained horse will suit the inexperienced rider; and even a senior rider with experience may be better off with a "gentle" horse rather than a feisty one. The important thing to remember is for people to know their abilities and match it to the age and training of the horse they want to ride. As people age, sometimes fitness suffers. One aspect of horseback riding in the senior years to keep the body fit. Horseback riding properly uses different muscle groups. The core of the body is extremely important for balance in the saddle. Strengthening abdominal and lower back muscles will aid in maintaining proper balance in the saddle. Hips need to be loose and flexible; shoulders and upper back need to be static. There are numerous exercise programs that will keep the body in riding shape. Yoga and Pilates are two types of exercises that will help keep the body fit for horseback riding.Another good way to stay fit and help with balance is using an exercise ball. According to the American Medical Equestrian Institute, 60% of all deaths that are related to equestrian are the result of head injuries. Experienced riders are at times, loath to even the thought of wearing helmets; especially those in disciplines where helmets are not required. However, riding helmets are the most sensible way for increasing the safety of senior horseback riders. Other apparel depends upon the discipline in which the riders are interested. Will they need show clothes, riding breeches, or jeans and chaps? If riders are simply interested in pleasure riding around the ranch; jeans and a shirt will suffice. Boots are recommended so that feet don't get caught in stirrups. Those who have not ridden before are wise to find a good trainer to help them learn the intricacies of riding properly. Another factor is mounting the horse. Most stables have mounting blocks that are used to assist in getting on the horse. It is much better to use common sense and not let pride get in the way of a good riding experience. Horseback riding can be fun and exhilarating. Age doesn't have to define who rides.Whether a long held dream coming true; or a continuation of a joy beyond measure; riding horses is an amazing adventure. The copyright of the article Continue Horseback Riding Into the Golden Years is owned by Cheryl Weldon and permission to republish in print or online must be granted by the author in writing. Safety first! 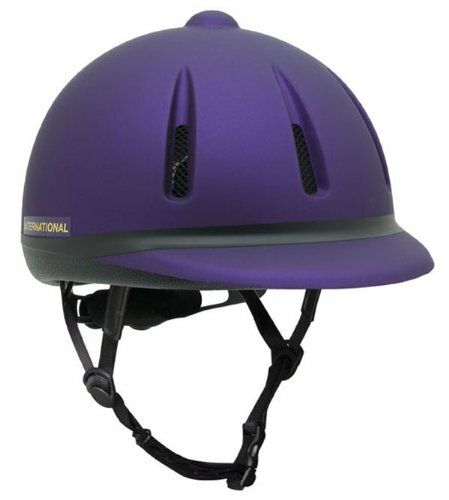 Protect the noggin with this dial fit horseback riding helmet.